I have two favorite games I like my students to play — one for confidence and one for a reality check. The first game is a best ball scramble and the second game is a worst ball scramble. Playing these two games on the golf course will tell you more about the state of your game than anything else I know. First, the best ball scramble. How it works: Hit two balls from every spot — including the putting green — and go to the best one. I first played this game as a young assistant golf pro — after being challenged by my head professional, John Falcone. He was playing well. So well in fact, that he believed he could beat, with one ball, my two-ball scramble score. We were professionals at Cheval Golf and Country Club, an extremely difficult golf course just outside Tampa, Florida. And after working there for a few months, my best score to date was 71. Well, something magical happened that day when I played golf with John. I relaxed! Because I had two balls from every spot, there was less pressure on my first shot. All of a sudden I was freely releasing my driver and confidently stroking 4-foot putts. Just the thought of that second ball as a backup made my first shots better than they had been in months. And of course, when I hit the first shots poorly — I had a mulligan. That day, using two balls, I shot 64 and easily beat John. And although it wasn’t an “official” score — it still felt great and filled me with confidence. Making that many birdies is always fun – no matter how you do it. As a side note, the day after playing that game with John, I shot a 65 on my own ball and set the course record. I never would have done that without the confidence obtained by my “best-ball” game the day before. What this game does for you: Frees up your swing, putting stroke and thinking. And lets you see just how close you are to playing well. In playing this game, you should shoot the best possible score based on your skills. And along the way, learn a better way to approach your shots and putts. I recommend this game wholeheartedly for people preparing to play an event. Play this game a few days before your club championship and you’ll be filled with confidence. How it works: Hit two balls from every spot — including the putting green — and go to the worst one. I used to play this game a lot with a Nationwide Tour player and friend of mine – John Petit. 10 years ago, John was using our golf course as a home base and we became good friends and playing rivals. We would often play worst-ball when we bet and let me tell you — this was tough. This is an extremely honest way to play golf, as you have to hit two quality shots from every position. Even if you hit the first drive in the fairway — you still have to hit the second one. Even if you make the first 5-foot par putt — you still have to make the second one. So, as you can see — it’s tough! This game will tell you immediately how close you are to playing poorly. You cannot fake it. Back then, as a +2 handicap, I was always happy to break 40 for nine holes playing worst ball. What this game does for you: Makes you think thoroughly on every single shot. Course management becomes a big issue. You think more about where you want to miss the ball as opposed to hitting only great shots — and at least one shot ahead, as it relates to planning. You just can’t get up and smash it. I recommend this game for people who need course management help. However, have patience while playing this game, as it can be a difficult mental pursuit. I’m a big fan of these kinds of practice games on the golf course. Often, you can get as much out of a 9-hole scramble as you could a 5 hour driving range session. And of course, what I really want you to learn is — how to develop a game that’s a combination of the best-ball and worst-ball approach. You should be able to recognize, based on how you’re hitting it, what kind of attitude you should take to the course. Should you play the aggressive best-ball style? Or should you play the conservative worst-ball style? This may change based on your skills for the day. And that’s okay. 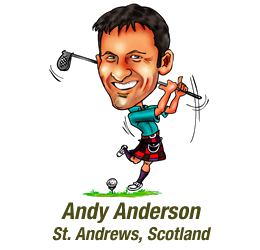 Great idea Andy….Now to get up early and get to the course to try it out…. Thanks for the tips, every little bit helps!! They sound like great practice ideas. Limited time means some backyard chipping and a bucket of balls before the game if I’m lucky. I like the tips – keep them coming thank you. Have often played the worst ball game ‘for fun’ early when no one’s around – have never looked at breaking 40 for 9 holes, but it’s certainly helped my concentration on each shot and playing under pressure. Nothing like draining a 10 foot birdie putt and then having to do it again! Another empty course game I liked to play was to aim my shots at fairway or green, but then chip/putt the ball into the rough or bunker. I liked being able to track fairways and greens hit, as well as working on scrambling – where shots are really saved: any mug can have a par if they’ve hit the green in regulation, but you’ll have a good day if you keep getting up and down. The chip/putt into trouble is always to a specific spot as well, not just a swipe, so there’s even more practice. It doesn’t have to be sideways; backwards or forwards can work too if there’s a bunker 50 yards from the green or into a ‘favourite’ bit of rough etc. Interesting. I, too, call it best/worse ball practice. However, my approach to this routine is to immediately correct missed shots, based on the theory that: “A mistake uncorrected is a mistake.” You may quote me on that. When a corrective shot is necessary, I play that ball â€˜out,â€™ too. That way I can measure improvement by noting the infrequency of corrected shots in a round. However, I challenge myself to make the next shot from the bad lie of the first ball, and I try to beat the good shot of the second ball. By doing this, I build confidence knowing that I have corrected all of my bad shots, but also know that I can overcome a not so good first shot with good second. In other words, if my drive is not so good, my 3 wood can still get me on the green. Since we tend not to practice getting out of bad lies, I just as often practice getting out of them. Instead of becoming disheartened with high scores from bad shots and letting them become ingrained in my psyche, I not only practice correcting these mistakes, but I practice hitting better shots as a result of them. I believe that this is the kind of practice needed for match play. Thank you for the tip (worst ball scramble) I like this one. I think we are very privileged to be able to play the whole year round (South Africa) or perhaps spoiled. Great suggestion to try the worse ball routine to help with course management – one of my weaknesses. Have been using a version of the better ball routine, but not for a full 9 holes, and it definitely shows what I’m actually capable of when everything clicks. Will try it for the full 9 next time I’m practising. Wow,what a brilliant idea,in both cases. It will encourage me toplay on my own more. Hi Andy,thanks for your tip on best and worst 2 ball. I tried the best ball and had 7 pars and 2 bogeys for 9 holes. Best I have played in 10 years. You are right, no pressure. At the moment I have put away my clubs for the year. Looking forward to next season. I have never broken 80, but even tho I’m going to be 67 in a couple of weeks, I still think that one day soon it will happen. Keep on sending good tips for my game. Thanks for all the tips Andy,they really help my golf game. I have too try this best ball , worst ball tip. Sounds like a very interesting way to work on your game. I,ll let you know how it worked. Thanks George…This sounds a great practice routine. I have often played the ‘better ball’ round, which does improve confidence….but never the ‘worst ball’ However I will try it at the first opportunity. It does sound VERY tough and could lead to some bent shafts ! only joking, as never lose my temper on the course. Not like a pal of mine who is known to all local golfers as ‘Black Cloud’ because of his terrible attitude when failing to perform to his best standards. He has spoilt many a happy round for his fellow players and now people strive to avoid being paired with him. He is a good player and has won several club competitions, but, as he gets older, he refuses to admit that he cannot hit the ball as far as he used to, so that the extra effort that he tries to put in often leads to a very wayward shot and then, beware anyone who remarks upon it !!! Still, it takes all sorts, as some idiot once said.